This was a mixed bag for me. It's half-memoir, half-history, and I much preferred the memoir part. Sarah Messer grew up in a centuries-old "red house" in Marshfield, Massachusetts. Her father bought the home in 1965 from a descendant of the original owner, Walter Hatch, who reportedly built the house in 1647. The house was given a patchwork of renovations and over the years, and parts of it were in danger of falling down. Hatch's will stipulated that the house should never leave the family, but for various reasons, Messer's father was able to buy the home, despite not being a relation. Messer alternates the chapters between her experiences of living in the house and the home's history, which she pieces together through documents. The colonial history was a bit dry and required a fair amount of skimming to get through. By coincidence, I had recently read another book about Americana, Jill Lepore's "Book of Ages," which handled the history aspect more gracefully than "Red House." My favorite parts of the book were Messer's childhood memories in the old house and how, as an adult, she and her siblings made efforts to repair and renovate it. There were also some great stories about ghosts who haunted the house, and how Messer herself talked to one of them in her sleep one night. Chilling! I picked up this book after reading an interview with the author Elizabeth McCracken, who said this is one of her favorite books. 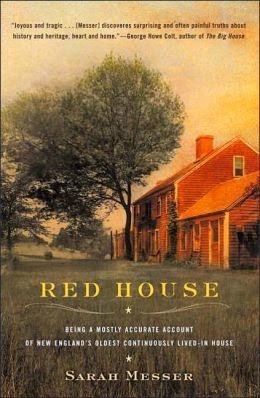 While "Red House" won't be a favorite, I did enjoy it and would recommend it to anyone who likes reading about the history of old buildings.